June 14, 2015 July 6, 2015 / Steve M.
This is a chance to trade the three titles published by the Paris Olympia Press all now expensive items, but these are duplicates which will also appear in my Traveller’s Companion duplicates listings , when I get to the higher series numbers. Bibliographical descriptions are courtesy of Patrick Kearney, The Paris Olympia Press, The Liverpool University Press 2007. (Index numbers EXAMPLE 5.88.1) are the actual location of the description in the bibliography. The images are the actual books, please leave a comment if you want any further information. 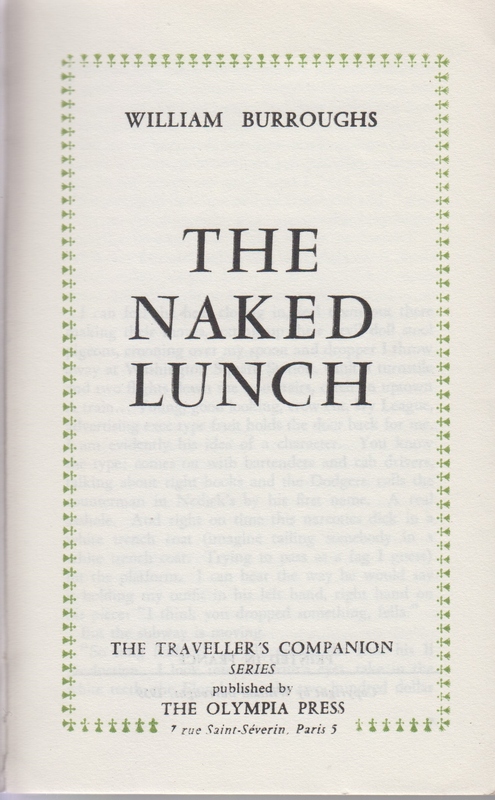 [Within a green border of type ornament:] WILLIAM BURROUGHS | THE | NAKED | LUNCH | THE TRAVELLER’S COMPANION | SERIES | published by | THE OLYMPIA PRESS | [breaking the border:] 7 rue Saint-Séverin, Paris 5 Collation: 232 pp. 76.1-76.148; 76.154. 17.5 x 11.0 cm., all edges trimmed. Printed on white wove paper. Contents: pp. [1,2] blank. p.  THE | NAKED | LUNCH, reverse blank. p.  title, as above. p.  PRINTED IN FRANCE | [rule] | Copyright by William Burroughs, 1959. p. 7-, text. p.  Printed by S.I.P., Montreuil, France, in July 1959 | Dépôt légal : 3e trimestre 1959. pp. [228-232] blank. Binding: Olive-green wrappers, printed in black, and trimmed flush with body of the book. 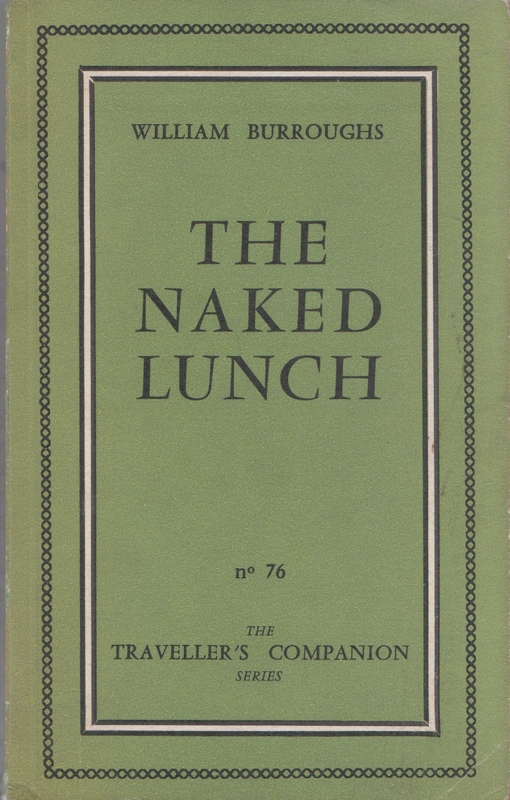 [Front cover; within a frame of two borders, the outer consisting of fine linked chain of type device in black, and the inner a thin band of white edged in black:] WILLIAM BURROUGHS | THE | NAKED | LUNCH | no 76 | THE | TRAVELLER’S COMPANION | SERIES. [Spine; within a white, black-edged panel, the series no. in horizontal digits at bottom and title lettered vertically up spine:] 76 [-] THE NAKED LUNCH. [Back cover, at bottom right-hand corner:] Francs : 1.500 | NOT TO BE SOLD IN | THE U.S.A. OR U.K.. 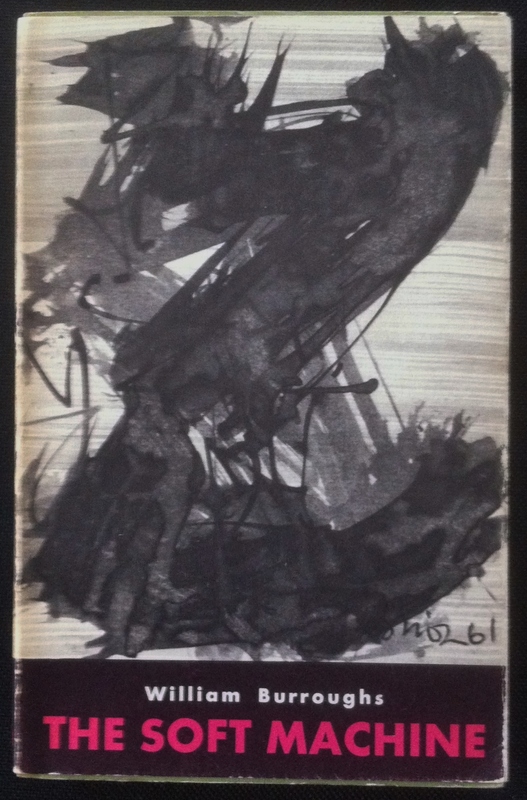 Issued in a white dustjacket, with a series of small black abstract designs in rows is printed horizontally across the front and back covers. [Frontover; within a purple panel running vertically the height of the book and occupying a little less than half its width, in white caps:] WILLIAM | BURROUGHS [within the purple panel, in gold caps:] THE | NAKED | LUNCH. [Spine; horizontally at bottom, in black:] THE | OLYMPIA |PRESS [vertically, in purple:] THE NAKED LUNCH [Vertically, in black:] WILLIAM | BURROUGHS. Inside flaps of dustjacket carry a B&W photograph of Burroughs, followed by a brief history of the book and some critical comments by John Ciardi extracted from an article he wrote for The Saturday Review (June 27th 1959). Notes: (1) The copy examined was in alatered state with the price of 1500 Francs overprinted with a rubber-stamp indicating a price increase to 18 NF. One Copy Very Good + minor creasing and marking to back cover see images above. FOR further discussion points on the dust jacket debate follow the link. THIS COPY VERY GOOD/ VERY Good Wrapper and Book: Full description and extra images on request. BIBLIOGRAPHICAL DESCRIPTION Courtesy of Patrick Kearney The Paris Olympia Press. The Liverpool University Press 2007. 5.91.1 THE TICKET THAT EXPLODED William Burroughs, 1962 [Within a green border of type ornament:] WILLIAM BURROUGHS | THE TICKET | THAT | EXPLODED | THE TRAVELLERS COMPANION | SERIES | published by | THE OLYMPIA PRESS | [breaking the border:] 7 rue Saint-Séverin, Paris 5 Collation: 184 pp. 91.14; 91.2-91.128. 17.4 x 10.9 cm., all edges trimmed. Printed on white wove paper. Contents: pp. [1-2] blank. p.  THE TICKET | THAT |EXPLODED . ACKNOWLEDGMENT | The sections entitled In A Strange | Bed and The Black Fruit were | written in collaboration with | Michael Portman. | The design on p. 183 is by | Brion Gysin. | Other works by William Burroughs |published by The Olympia Press : | THE NAKED LUNCH : 1959. | THE SOFT MACHINE | First edition : 1961. | New revised and augmented | edition : February 1963. p.  title, as above. p.  PRINTED IN FRANCE | by Imprimerie Desgrandchamps, Paris, December 1962. | [rule] | Copyright by William Burroughs, 1962. | Dépôt légal : 4e trimestre 1962.. pp. 7-, text. p.  blank Binding: Light olive-green wrappers, printed in black, and trimmed flush with body of the book. 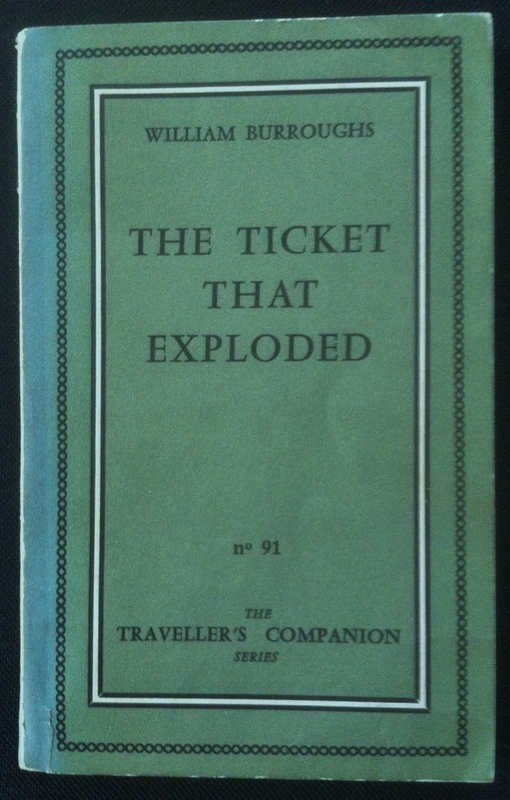 [Front cover; within a frame of two borders, the outer consisting of fine linked chain of type device in black, and the inner a thin band of white edged in black:] WILLIAM BURROUGHS | THE TICKET | THAT |EXPLODED | no 91 | THE | TRAVELLERS COMPANION |SERIES. [Spine; within a white, black-edged panel, the series no. in horizontal digits at bottom and title lettered vertically up spine:] 91 [-] THE TICKET THAT EXPLODED. [Back cover, at bottom right-hand corner:] 18 N.F. | NOT TO BE SOLD | IN U.S.A. & U.K.. Issued in a glazed, thin card dustwrapper, illustrated across the front, spine and back with a monochrome photo collage [by Ian Sommerville], torn unevenly across the bottom to reveal a white field crossing the front wrapper, spine and back wrapper, on which are printed author, title and publisher. 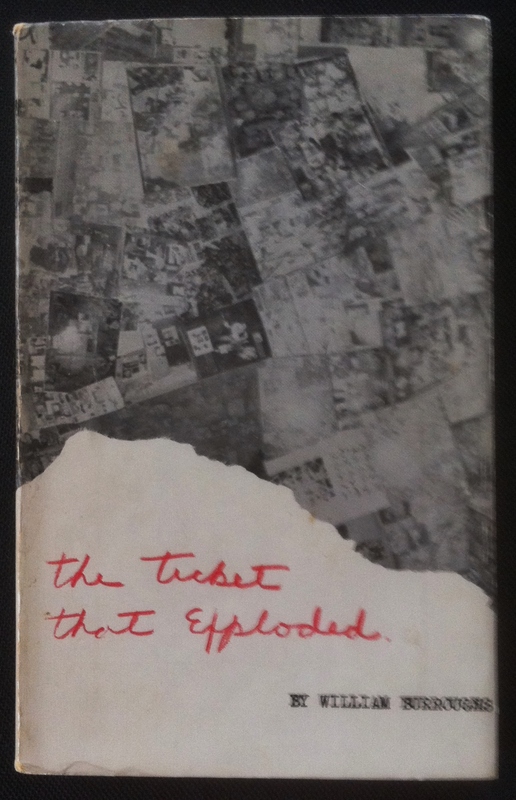 [Front cover; in red script:] the Ticket | that Exploded. | [typewritten in black:] BY WILLIAM BURROUGHS. [Spine; printed vertically up spine:] [typewritten in red:] THE TICKET THAT | EXPLODED | [typewritten in black:] WILLIAM BURROUGHS. 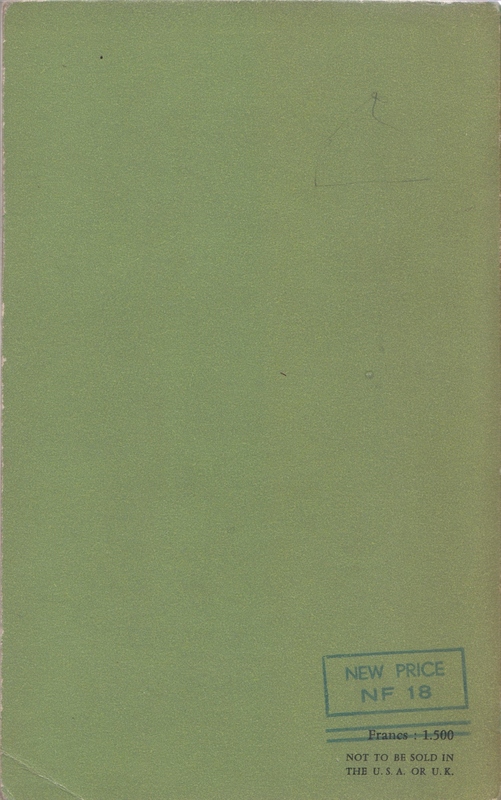 [Back cover; typewritten in black:] THE OLYMPIA PRESS. Inside front flap carries a black & white photograph of Burroughs for its entire height over which is superimposed a white panel containing the first part of some notes concerning The Ticket that Exploded. This design is repeated on the inside back flap, where the photograph is tinted pink and the blurb concludes. THIS COPY GOOD/ VERY Good Wrapper and Book: Full description and extra images on request. ANOTHER COPY about GOOD + No Wrapper. Details and extra images on request.